I come from there, and memories are what I have. I was born just like you; I have a mother and a home with many windows. I have brothers, friends and a prison with one cold window. A wave stolen by seagulls, my own scene, an excessive herb. the livelihood of birds and an immortal olive tree. I wandered through this earth before these swords passed over a body turning it to a feast. I come from there. I bring the skies back to its mother when it cries over its absence. I cry, so that a returning cloud may know me. I learned each language suitable for the court of blood so that I may break the rules. I learned the entire language, then disassembled it, in order to compose a single word: homeland. Mahmoud Darwish (1941-2008) was an award-winning Palestinian author and poet. His literature, particularly his poetry, created a sense of Palestinian identity and was used to resist the occupation of his homeland. The Israeli government forced Darwish to live in exile for 26 years after he joined the Palestinian Liberation Organization (PLO) in the 1970’s. During that time, the poet addressed issues of exile, homesickness, and a love and yearning for a home to which he was unable to return. 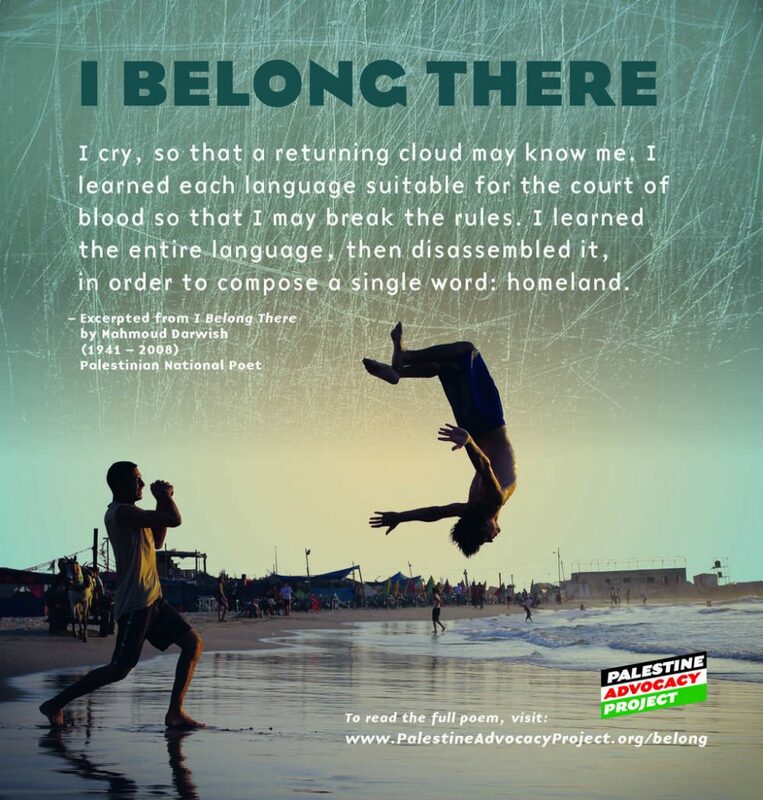 The poem ‘I Belong There’ was written during this period in Darwish’s life. He compares his state of exile to a “prison cell with a chilly window,” where he longs to be at home with his friends, brothers, and his mother. Darwish found comfort in his writing during those 26 years, and he learned to use it as a form of resistance. In ‘I Belong There,’ however Darwish explains that he has used all the words available to him, and can draw from them only the single most important word: homeland.